In October 2015, the European Court of Justice (CJEU) struck down the U.S./EU Safe Harbor agreement that enabled data to be freely transferred from Europe to the United States. In February 2016, the EU/U.S. Privacy Shield was proposed as a replacement. 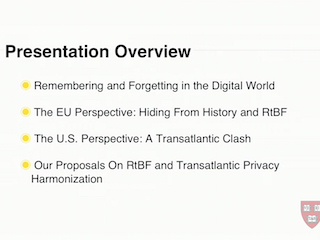 These developments demonstrate some of the ways the European Union’s far-reaching Right to be Forgotten (RTBF) is posing legal, economic, and cultural challenges for the U.S. and its EU trading partners. In this talk Sanna Kulevska — who works on Internet law issues at the Legal Department of Google’s European Headquarters in Dublin — and Michael L. Rustad — author and Co-Director of the Intellectual Property Law Program at Suffolk University Law School — lead a discussion of the legal dilemmas that policymakers face in walking the tight rope between the Scylla of constraining the right of expression and the Charybdis of diminishing an individual’s right to control their personal data. The authors will use current case studies of takedown requests from Google to provide context for their discussion of how a Safe Harbor 2.0 might achieve the proper balance between expression and privacy.